In early November, Texas reached a milestone no state aspires to: 18 years without a death-free day on Texas roadways. The roadway death toll for that 18-year-period tops 66,000. In 2016, 3,776 people died on Texas roads, while 23 states saw fewer than 500 traffic fatalities. In part, the large number of Texas traffic deaths is attributable to the size of the state and the number of roadways maintained—about 80,000 miles of road in total. But, there’s more to the story. Factors within the control of Texas drivers, planners, legislators, law enforcement and courts contribute to the high number of highway fatalities in the state. One significant factor in the high number of injuries and deaths on Texas roads is a much higher-than-average number of drug and alcohol related crashes. The Houston Chronicle compared alcohol and drug related traffic fatalities across ten major metropolitan areas in the U.S. and found that the Houston and Dallas topped the list. Over a 16-year-period, the Houston metro saw more than eight times as many drugged and drunk driving deaths as the Boston area, four times as many as Atlanta and San Francisco, nearly twice as many as Chicago and more than 50% more than Los Angeles. The Dallas metro area was a close second, just ahead of New York City. Legislation, law enforcement and the courts play important roles in decreasing drunk driving and drugged driving injuries and fatalities in Texas and around the country. But, much of the solution lies in the hands of individuals. Obviously, refraining from driving after drinking is a critical step. If you have any doubt at all about whether you’re sober enough to drive both legally and safely, choose another option: stay where you are, call a cab or an Uber, ask a friend for a ride, or find another safe option. If you realize after getting behind the wheel that you shouldn’t be driving, find the first safe place to stop. When you witness this type of behavior on the road, steer clear—an impaired driver may act unpredictably, so the best way to protect yourself from a collision with a drunk driver or driver who is under the influence of drugs is to keep your distance from the vehicle he or she is operating. The next step is to report a drunk driver as soon as you can safely do so. Sometimes people do not report drunk drivers because they don’t want to be responsible for another person getting arrested. Sadly, many drivers are inclined to “mind their own business” when they see other drivers behaving erratically. But, pulling over alongside the road to make a call to authorities could save a life—perhaps even the life of the driver you’re reporting. The more information you can provide about the location and the vehicle, the better. It is simply the right thing to do. 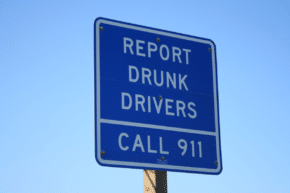 In Texas, you can report a drunk driver by calling 1-800-525-5555. This number is printed on the back of every Texas drivers license as a non-emergency number for motorists. If the person is driving dangerously and poses a threat to others or themselves, this is an emergency situation and you may also report by calling 9-1-1. The life you save may be your own.